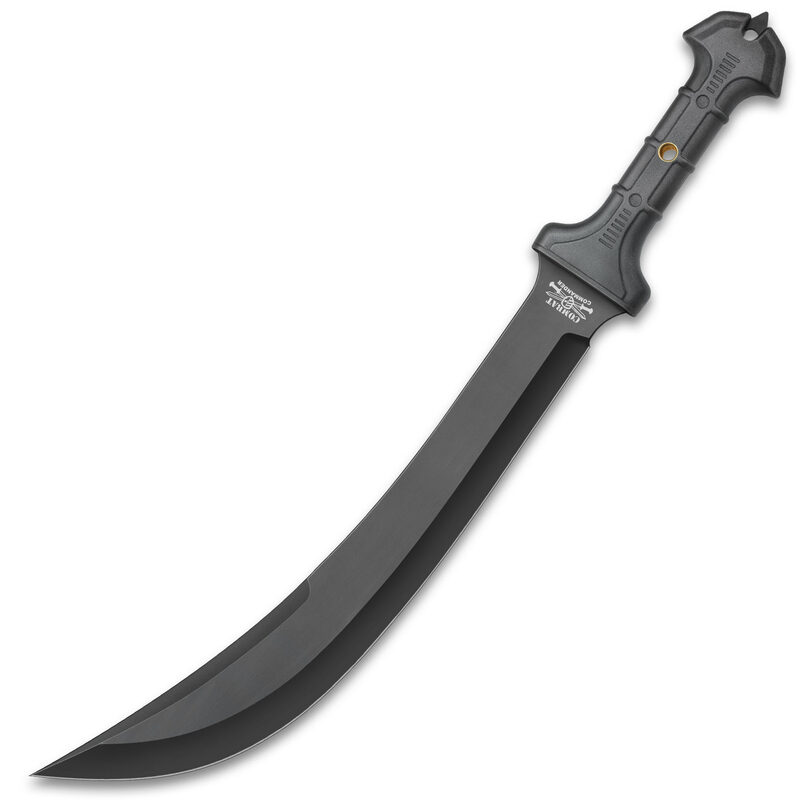 24.5" Overall with an 18" sharpened, 1055 forged carbon steel blade in leaf shape with a black anti rust coated finish. Comfortable ultra strong polypropylene handle, ideal for controlling the brambles and dense undergrowth. Now you can practice your tameshigeri skills and have a great looking garden too. Famed for its countless exploits in the trenches, the rubble-strewn streets and the thick jungle, it carved out a reputation for effectiveness that still echoes today. Our modern interpretation of this true military classic features the same instantly recognizable broad spear point and false edge with the addition of a strong steel reinforced guard and rugged weather-proof handle with a generous lanyard hole in its contoured, comfortable and virtually unbreakable polypropylene handle. 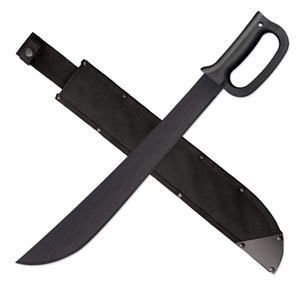 A tool that can only be described as part machete, part short sword, our Smatchet is fully sharpened and coated with a rust resistant matte finish that is baked onto the 1055 Carbon Steel blade for extra durability. Featuring a massive, rock-solid full tang blade, these machetes can surmount any back country challenge, even in the harshest environmental conditions. Combined, the two distinct cutting edges allow for maximum cutting efficiency and are perfect for practically any chore – clearing brush from the trail, hacking wood for a lean-to, sawing through thick tree limbs and much more. The rubberized injection molded handle is every bit as capable and tough as the blade. The Black Ronin Tanto Knife from United Cutlery has a modern, sleek look and feel. 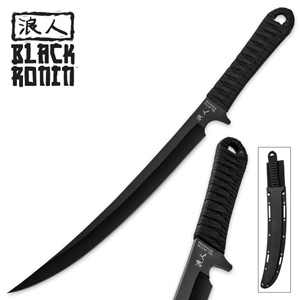 The rogue samurai warriors of the same name would have definitely added this tanto knife to their gear. It features a razor sharp 12 3/4" black coated stainless steel blade, and the handle is faux ray skin, wrapped in elegant black nylon cord. A tough injection molded sheath with a nylon belt loop is included. The full tang sword features a powerful 16 5/8" 1065 sharpened high carbon steel blade, curved like the iconic "sica" swords wielded by Thracian - aka "Thrax" - gladiators in arenas throughout Rome's expansive empire. The rubberized TPR handle provides a sure grip, great quality item with black nylon belt sheath not shown. 21" overall. 15" black oxide coated high carbon stainless sawback blade. Full tang. Brown and black finger guard co-molded rubber grip. Field marker/glass breaker end. Lanyard hole. Black nylon belt sheath.